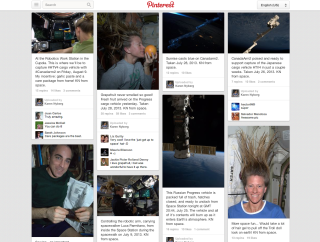 NASA Astronaut Karen Nyberg posts photos depicting her life onboard the International Space Station to Pinterest, a social media website. Image released Aug. 13. A NASA astronaut has taken the social media service Pinterest into the final frontier, where she pins her favorite space photos while soaring around Earth on the International Space Station. Since launching into space in May, astronaut Karen Nyberg has been "pinning" away on the photo sharing social media website Pinterest, documenting her months-long space voyage. Nyberg, who is also chronicling her space exploits on Twitter as @AstroKarenN, had more than 6,300 followers on Pinterest as of Tuesday (Aug. 13). Astronaut Karen Nyberg tweeted this photo of the sunrise and moonrise as seen from the International Space Station. Image released Aug. 4, 2013. Social media has been a ubiquitous tool for astronauts living in space since 2009, when NASA astronaut Mike Massimino sent the first Twitter message from space during a mission to the Hubble Space Telescope. Canadian astronaut Chris Hadfield became a social media star thanks to his regular Twitter, Facebook and YouTube updates, and some astronaut profiles on NASA's website prominently feature social media links and handles ripe for following. "Astronaut by day," Nyberg's Pinterest bio reads. "Aspiring quilter, crafter, artist, runner by night. Wife and Mommy 24/7. Currently living & working on the International Space Station." Nyberg's diverse areas of interests — including quilting, crafting and running — take center stage on Pinterest. While some of Nyberg's 23 pin boards are still devoted to those other interests, the astronaut uses about seven boards to bring photos and information about spaceflight and the science of it to her followers. "When girls see pictures of ponytails, don't you think it stirs something inside them that says, that could be ME up there!" Nyberg wrote introducing her "hair in space" board. Nyberg also pins photos of Earth from space and has devoted one board to "simple joys on Earth" — a hashtag she used on Twitter to share parts of her life on the planet before launching to the International Space Station. Nyberg has also posted photos documenting her preparation for spaceflight as well as photos of other astronauts on either shuttle missions or onboard the International Space Station. "Astronaut Suni Williams on the ARED (Advanced Resistive Exercise Device) on the International Space Station," Nyberg wrote in an image description for one of the photos on her International Space Station board. "Weight (resistance) training in microgravity to stay fit and keep bones strong!" Nyberg is currently a flight engineer with the International Space Station's Expedition 36 crew. But this isn't her first time in space. In 2008, she visited the International Space Station on the space shuttle Discovery, but it was a quick trip at only 14 days. Nyberg launched to the orbiting laboratory on May 28 with Russian cosmonaut Fyodor Yurchikhin and European Space Agency astronaut Luca Parmitano. They are now living and working with NASA's Chris Cassidy and cosmonauts Pavel Vinogradov and Alexander Misurkin onboard the $100 billion outpost. You can explore Nyberg's posts and start following her on Pinterest here.